Used Hyundai i20 Review - 2015-present | What Car? What's the used Hyundai i20 hatchback like? Buyers after a well-built and handsome small car could do a lot worse than cast a glance at the Hyundai i20, for it has some good genes under its bodyshell. 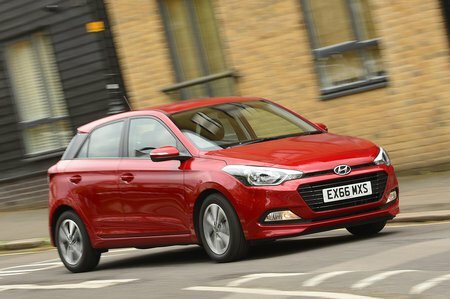 Not surprisingly, it sits between the impressive i10 city car and the iconoclastic i30 family hatchback, and these are both Hyundais of innovative design and up-to-date driving manners that have helped shift the Korean marque in people’s perspectives from bargain-bucket also-ran to competitive potential purchase. It sits in a hotly contested class, of course, with rivals that include the iconic Ford Fiesta and the excellent Skoda Fabia, and it’s available as a five-door hatchback, a three-door coupe and a rugged-looking SUV called the Active. There’s a wide range of engines on offer, too, including four petrol and two diesel options. Petrols kick off with a 1.2-litre with either 74 or 83bhp, or a three-cylinder 1.0-litre unit with either 99 or 118bhp. A 99bhp 1.4 is the only automatic option in the range. If you want to go diesel, there’s a choice of a 74bhp three-cylinder 1.1-litre or an 89bhp 1.4 four-cylinder. Trims start with entry-level S, which is a little basic and lacks air-con and Bluetooth, and moves up through SE, which adds alloy wheels and rear parking sensors, Premium SE, which throws in heated seats and a sunroof, while the Turbo edition gets a 7.0in infotainment screen as standard. Confusingly, the three-door coupe version calls these last two trims Sport and Sport Nav, although they offer exactly the same equipment. On the road the 1.0-litre engine is the best performer in the range, in either of its power outputs. Both feel good, even on motorways, although only the higher powered 120 version gets a six-speed manual gearbox. The 1.2 and 1.4 engines feel a little sluggish, even if they are quite refined, while the diesel options are both a little tardy in their responses, and occasionally a little noisy. 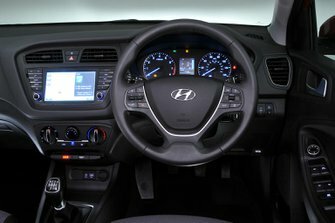 The i20’s steering is a little slow and heavy, although it is an easy and safe car to drive, with both good grip levels and predictable handling. Its ride is generally comfortable, although it can be caught out by sharp road imperfections and feels a little choppy around town. Inside is a good driving position with excellent visibility, and the dashboard is logically laid out and simple to use. It feels solidly built and fairly plush, with good use of soft-touch plastics, and there’s a responsive 7.0in touchscreen infotainment on higher spec cars. Space in the front is truly excellent, while rear seat passengers get plenty of leg room and a good amount of space across the car. Added to that boot space is one of the biggest in the class, with easy access and a height-adjustable floor on higher trims.